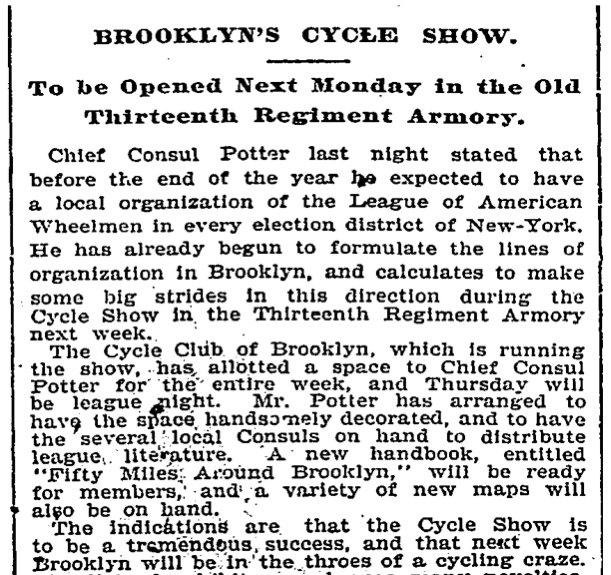 In about a month the New Amsterdam Bike Show will be held in Manhattan, about 114 years since one of the biggest bike shows New York ever saw, the Brooklyn Cycle Show, held in the Thirteenth Regiment Armory. The show would have happened at the height of the Great Bicycling Craze that began with the invention of the safety cycle, the design of which is more or less the same as what most people ride today, unless you’re still kicking around on a penny farthing. The interest being taken in the show by Brooklynites is marked. A novel plan of distributing 100,000 buttons was adopted by the committee two weeks ago, and nearly every boy and girl in Brooklyn is now a walking advertisement for the show. 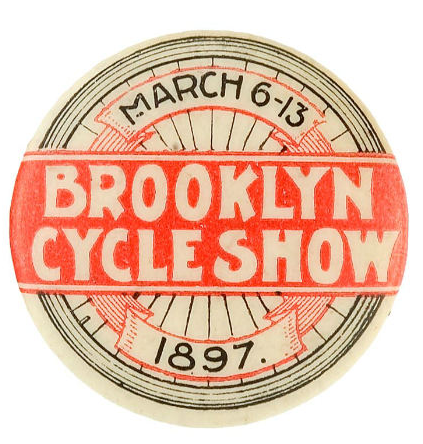 Via The New Victorians, you can check out a great collection of old ads related to the Cycle Show that ran in the Brooklyn Eagle on March 10, 1897. Here’s one from a store located at 467 and 469 Fulton Street, which would put it in what is now the Fulton Mall. And here’s one from an exhibitor at the show. Note the address. 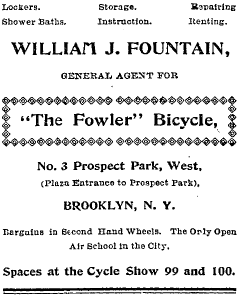 Over a century later, it’s nice to see that the “craze” of cycling is back, although this time around, with a more crowded New York and real, urgent issues related to transportation and the environment, I think it’s something more. ← Have You Been Called by a NBBL Pollster?